Today, dear knitters, let’s talk tools. Specifically, your go-to, never-be-without knitting tools. When you sit yourself down and pick up your project (surely, one of many on the go), what is in your trusty knitting bag that is next to you? Well, today I will give you a look into my personal tool chest, in no particular order. First off, the bag itself. 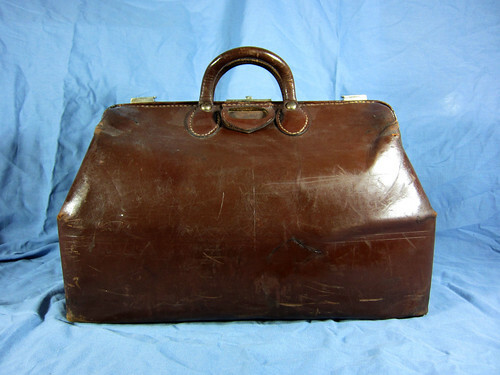 A truly fantastic and thoughtful gift, this vintage doctor’s travel bag is now the headquarters of my home knitting. Rigid, of a good size, and boasting a large opening (almost maw-like in it’s gape). Some internal pockets help keep things in order (though a few more would be nice). Now, I don’t really have a proper travel bag at the moment. 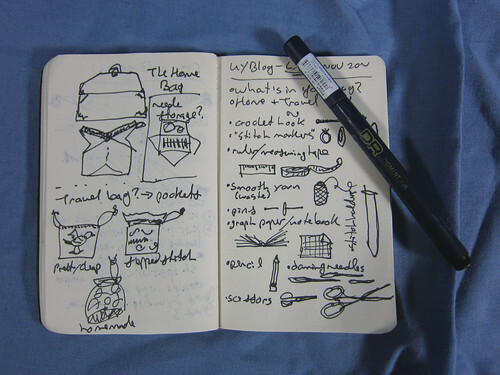 I typically stuff any portable necessities into the individual project bag, of which I have several. 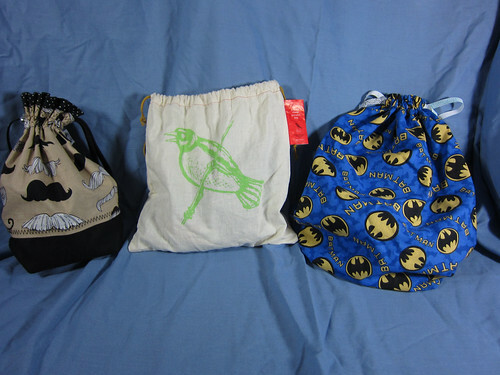 A mustachioed Slipped Stitch design bag, a Pretty Cheap Blue Sky Alpacas bag, and my favourites, a few custom-sewn bags from a good friend. Needles. I have a lot of single needles: circular, straight, double pointed, but since picking up a set of Addi Click, they are the only ones that actually stay in my bag. I use the new Long Lace Tip set, and they are fantastic (we have a whole post about interchangeable needles lined up, so I won’t say more for now). A crochet hook. I don’t crochet. Well, I can crochet enough to clumsily produce a provisional cast on, but that is it. A hook is good for more than crocheting, though. Picking up dropped stitches, back scratching, snagging ends of yarn, working a steek reinforcement, the uses of a good hook are endless. Stitch markers. 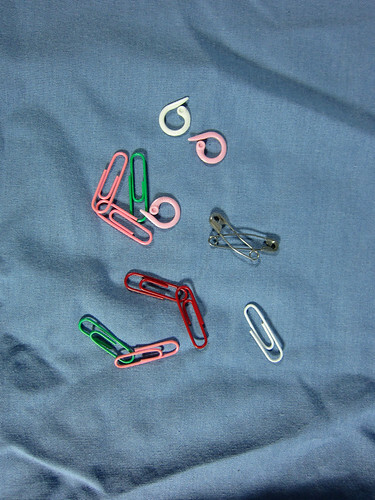 When it comes to stitch markers, I often use whatever is to hand – scraps of yarn, paper clips, or in the rarest of cases, actual stitch markers. We are knitters, we are resourceful! I saw someone come in the other day who was using a diamond ring as a stitch marker – talk about knitting dedication! 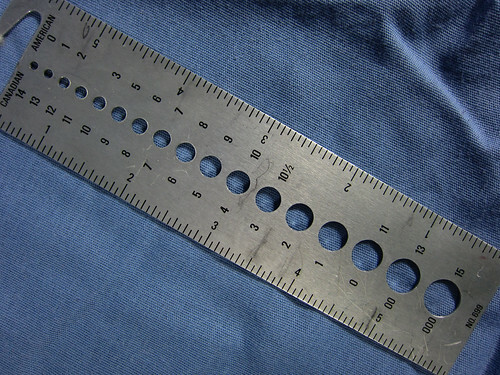 Ruler and measuring tape. Checking gauge, measuring progress, garments, body measurements – a measuring tool is really, really essential because it’s not something that you can easily eyeball. I like to have a clear ruler for gauge, and a flexible tape for bigger, less straight things. One caveat, however, cloth and plastic measuring tapes will stretch with use and time, and should be replaced periodically. Smooth waste yarn. For holding stitches that don’t lay in a straight line, or just lots of stitches, working provisional cast ons, marking fabric, some spare yarn will always come in handy. Fine mercerized cotton or crochet cotton is best as it won’t felt/stick to your work and can be easily pulled out when it has served its purpose. Pins. 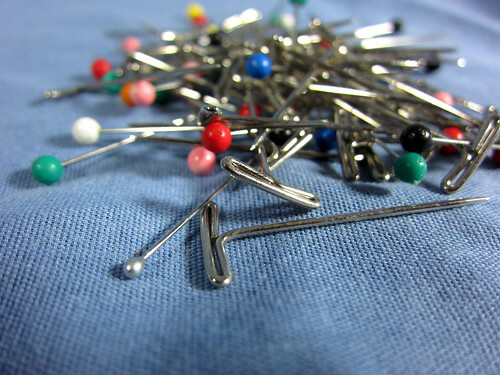 Straight pins, T-pins, wooden marking pins, safety pins all have a multitude of uses. You should never be without a tinful. 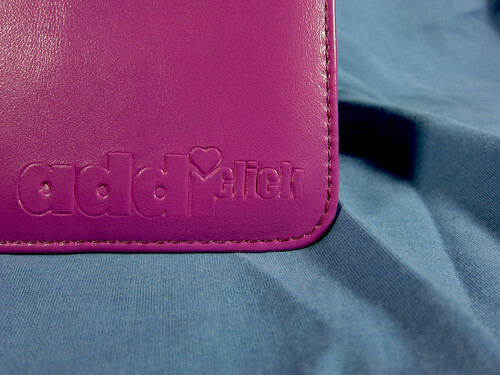 Stitch holders. I typically use waste yarn in place of stitch holders, but they can be useful nonetheless. Graph paper notebook. I keep graph paper on hand at all times. I don’t usually keep a line or unlined notebook, just every-purpose graph paper for notes, counting, sketching ideas, graphing, anything and everything. A Pencil. I keep a jar of pens and pencils of all sorts close to hand at all times, but if I had to choose one, it would be a mechanical pencil – can be erased for corrections, and makes a satisfying clickety noise. Scissors. Short, sharp scissors. 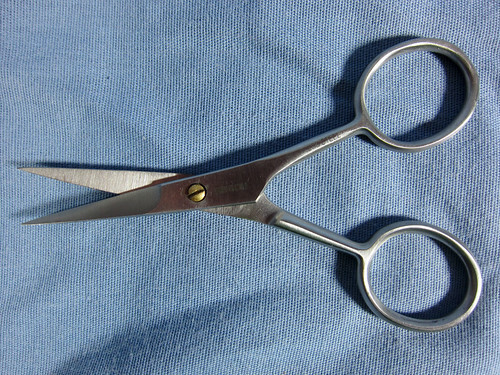 Little to no need for big quilting shears, a small, finely-pointed set of snips will serve you well and reduce the risk of collateral cuts when trimming yarn ends or cutting open a steek. Finally, darning needles. Large, small, blunt, sharp, they are all useful for different tasks. I cannot for the life of me keep track of mine, and I must end up buying a new set every few projects. I think that one day I will find a stash of about five hundred needles in a corner somewhere. For now, I will keep accumulating them. So, what have I missed? What absolute essentials are in your knitting bag? This entry was posted on Saturday, November 24th, 2012 at 11:48 pm	and is filed under Tool Time. You can follow any responses to this entry through the RSS 2.0 feed. Both comments and pings are currently closed. I love my Chibi darning needles! They have a bent tip which makes it easier to pick up stitches for grafting. I’m so used to using these needles that I use them for seaming, too. Bonus: they come in a little tube with a screw cap which I use for storing them. AND the tube is easier to keep track of then loose needles which tend to get lost Hint to Michael, these tubes might be a solution to your wandering darning needles. Oh, but being organized takes all the fun out of those 3 AM hunts for a needle because something is due to be gifted in six hours! 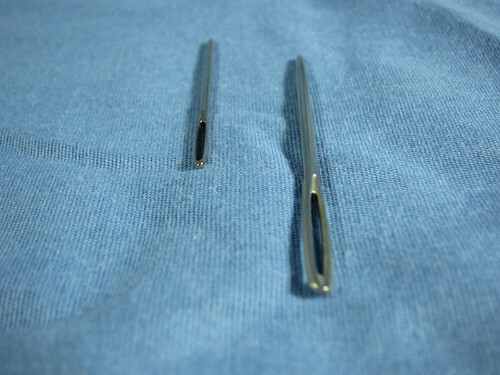 Seriously though, the bent-tip needles are hugely popular – almost everyone who ends up trying them swears by them. Good post! I also carry stitch holders, a row counter, Post It notes and a pencil.